Here a some Snapchat-like apps with some selfie filters for Android and iPhone that free to download and install to your phone. These apps are similar to Snapchat in photo editing, could be some good alternatives. Tired of being locked by Snapchat? unable to login because you lost your phone number? These alternative apps similar to Snapchat maybe interest you. What makes these apps similar to Snapchat is because they have selfie filter just like Snapchat’s lens. 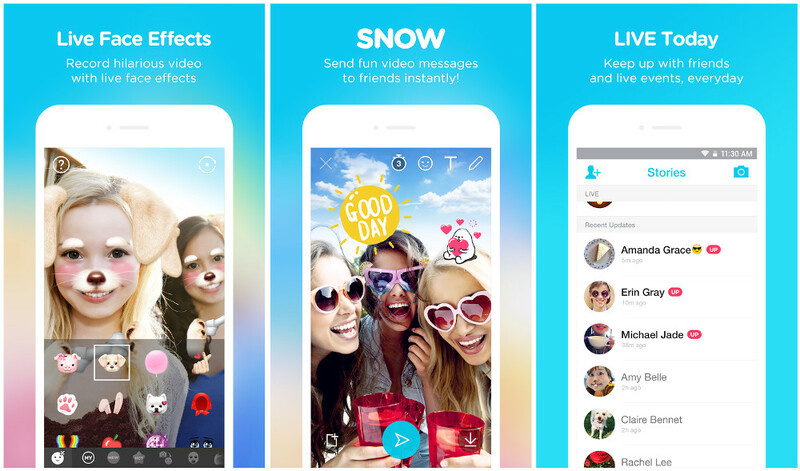 If you only using Snapchat for the filter lens and often use the messaging feature, then these Snapchat-like apps are suits you. Snapchat’s filters or lens is the main feature of this application that was previously used as sexting app. Many similar application coming up, but they more focus to image manipulation filters and special effects. 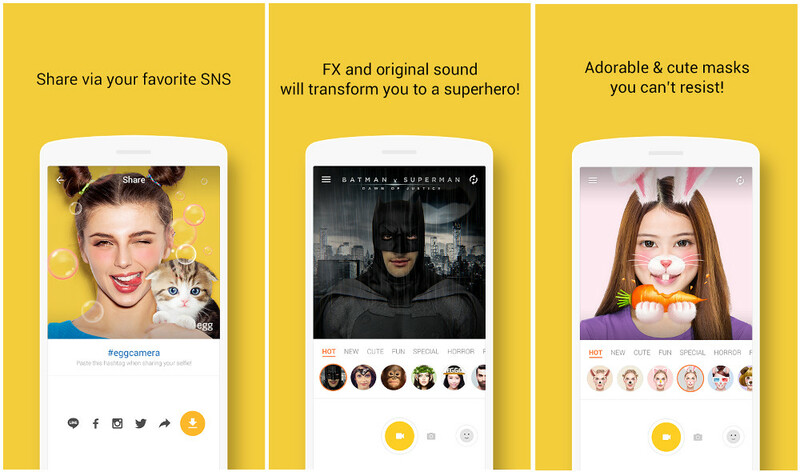 Here are those Snapchat-like apps with selfie filters and effect. LINE originally is a chat messaging app with a bunch of cute stickers. Recently they released a Selfie App called egg. This application is similar to Snapchat in the image manipulation section. egg lets users add filters (they call it mask) and special effects to photos and videos. There are a bunch of 3-D masks, which are applied to their faces in real-time. Some masks may include special effects that users can trigger by performing certain actions, such as blinking or opening their mouths, just like when you do rainbow puke face on Snapchat. This app also allow you to create your own masks or filters by using another picture. For example, you can use your friend’s face and use it as a mask. The other feature that similar to Snapchat’s filter is swap face, yeah! After you finish creating a selfie with mask and special effect, you can share it to many social media apps like LINE, facebook, and instagram. You can also download the photo or video to your phone. Snow is a totally rips off Snapchat’s features and functionality, even the button icons looks identical with Snapchat’s. This app is developed by Korean Korean company Naver, the same developer that created LINE messenger. This app even have the same dog face filter. But there are some differences, this app has a GIF maker (similar to Instagram’s Boomerang), and the stories will last 48 hours instead of 24 hours. The app has had roughly 30 million downloads in Asia alone since its release in September. This app is just like Asian’s Snapchat. Story, a whole new way to share your moments. When you add videos to your story, videos appear in chronological order and disappear in 48 hours! No feeds, No history. Self destructing messages. Photos and videos sent to your friends in SNOW can be replayed only within 24 hours. No more worries for ridiculous selfies(Plus, we notify you if anyone takes a screenshot). Snow is available for free on Play Store and App Store. Just like the other two, this app provide some super-cool effects. You can also find the masks that take two faces to activate. It’s consistently delightful to scroll through the masks and try out the photo effects. 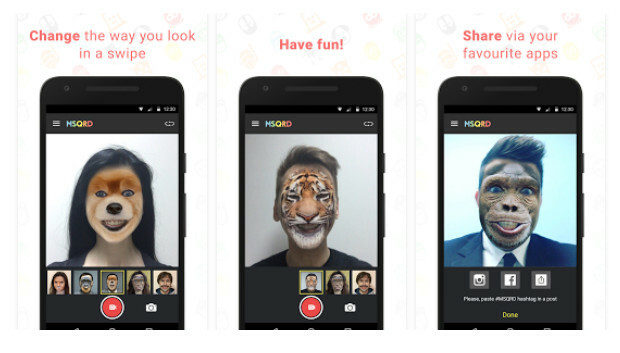 You can use the mask and Record video selfie animations, change the way you look and send it to friends via your favorite messengers and social networks. You can also send it to your Snapchat by using Snapchat Memories. If for some reason you can’t use Snapchat app on your phone, these apps can be a good alternatives. If you prefer to use Snapchat’s filters to having fun with your selfie, then we recommended you to use egg, this app is also more save for children. But if you want a longer duration for your stories available, you can try to use Snow. Let your folks know about this awesome apps that similar to Snapchat with filters. The title of this article says that you are going to recommend 3 Snapchat alternatives – am I missing something or did you only list two (egg & Snow)?